Buy The Dark Eye: Blackguards Deluxe Edition and get the games download now! What happens when the only hope of a threatened world lies not with heroes in shining armor, but is placed in the hands of a band of misfits and criminals? 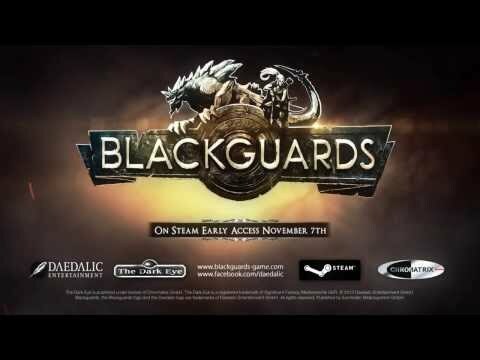 Blackguards, the new turn-based RPG by Daedalic Entertainment, explores this very question. The player takes on the role of a convicted murderer who must use the help of a team of more than questionable characters to save the world from a dark menace. Through this wild chase throughout the South of Aventuria, the world of The Dark Eye, there is more to fight than vicious creatures. Chapter by chapter you’ll encounter a story full of intrigue and surprising twists. Time and time again, the moral compass of the player will be tested. One does not beat Blackguards without getting their hands dirty. But when life and death are in the player’s hands, how far will they go to reach their goals? Over 180 individually crafted battle maps full of interactive objects and strategically complex situations expose the player to exotic locations and put them through deadly trials.